Plan your escape to Delphi’s award-winning spa, where you can inhale… exhale… and feel the stresses of everyday life drift away. Treatments start at just 25 minutes long, and packages offer up to 3 full days of pampering. Treat yourself or someone else to a body wrap, a massage, a facial, or all three. We use only the best deluxe products, blended from pure organic ingredients that nourish the body, mind and soul. The Spa at Delphi Adventure Resort is a unique place where guests can escape, unwind, contemplate and relax. 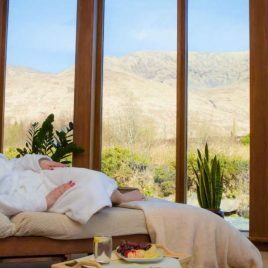 Nestled amongst breathtaking scenery, the award winning spa in Leenane, County Galway is natures very own picture perfect paradise.